Shuangliu National Forest Park is situated next to the southern highway and features the beautiful rivers. The origin of Fenggang River is inside the park and Shuangliu Waterfall is over 20 meters in height. The pounding sound and dense mist of the waterfall are the most famous scene in the park. There are thick forests in the park, making it a perfect place to expose oneself to the nature. There are pavilions and stone chairs along the track for visitors to take a rest. 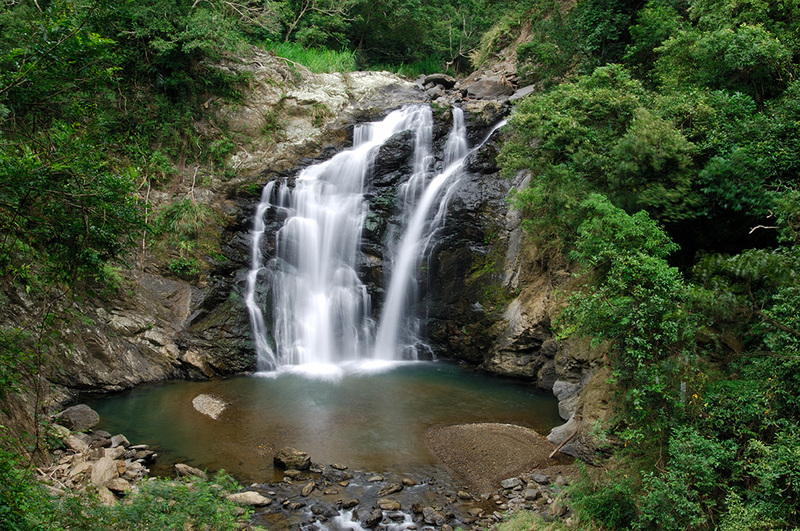 The track from the entrance to the waterfall has beautiful scenery and is suitable for recreational activities. There are chairs, pavilions and trash cans. Maozi Mountain is the highest point in the park, 650 meters in altitude; standing here, you can overlook the mountains, the Pacific Ocean and the Taiwan Strait. Shuangliu Waterfall is 3,650 meters away from the entrance and is the origin of Fenggang River. Visitors can enjoy the fresh water, the butterflies and the beautiful scenery in the park. Nat'l Hwy 3 → Exit at the Nanzhou Interchange → County Hwy Route 187B → Prov. Hwy Route 1 → Prov. Hwy Route 9 → Shuangliu National Forest Recreation Area.